Hair Transplant Market size was valued over USD 5 billion in 2017 and is expected to witness more than 25% CAGR from 2018 to 2024. Increase in number of people suffering from hair loss problem will foster hair transplant market growth over the projection years. According to the Belgravia Center, around 60% of men and 40% of women experience hair loss, female pattern hair loss and male pattern baldness in their entire lifetime. The major factors contributing to hair loss in people are genetics, stress, illness or medication climatic and water condition and physiological factors such as malnutrition, stress and ageing. With growing hair loss rate, the demand for transplant procedures and related therapies will rapidly increase in near future. 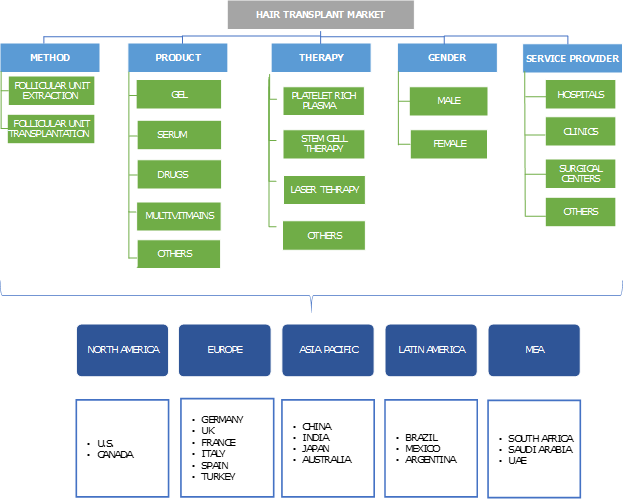 Recent technological advancements in the developed regions of North America and Europe will augment hair transplant market size. Introduction of technologically advanced robotic surgical hair transplant system, such as the ARTAS system will result in efficiency and safety of the procedure. Also, increasing use of Neograft Hair Transplantation System, a rapidly evolving technology for both men and women that desire to restore their hairline using Follicular Unit Extraction (FUE) method will boost the industry growth. Booming medical tourism in Turkey for hair loss treatment is one of the major driving factors responsible for the growth of hair transplant market. With around 300 clinics especially for hair transplant alone, Istanbul and many other major cities in Turkey attract patients from all over the world, mainly from Middle East, the Gulf region and Europe. Advanced technology, experienced surgeons and relatively low cost of hair transplant treatment in Turkey are the major factors responsible for boosting Turkey hair transplant market growth. Several adverse side effects of hair transplant treatment drugs will prove to be a major market expansion hindering factor. The most common side effects that are observed after using hair transplant treatment drugs are appearance of rashes and itching of skin. Additionally, increasing cases of people suffering from severe side effects from drugs such as chest pain, unexplained weight gain, swelling of the tongue, lips, hands or feet, loss of consciousness and palpitations will hamper the demand for hair loss treatment, restricting industry proliferation. Drugs product market segment held around 50% share of total product market valuation, accounting for a total value of USD 935.3 million 2017. Adoption of new and innovative drug therapies will rise in near future due to expanding availability and accessibility of hair transplant treatment drugs. Increasing use of Finasteride and minoxidil drugs will lead to their exponential sale, further driving the market segment growth. Rise in number of drug prescriptions for hair transplant treatment will propel hair transplant market growth during the forecast timeframe. Multivitamins product market segment is estimated to show lucrative growth in near future; it is estimated that it should grow with a CAGR of 25.6% from 2018-2024. Increase in consumption of multivitamins to counter hair loss problem and induce faster hair growth will result in high product demand and adoption rate. Rise in demand for multivitamins for post hair transplant treatment and rising awareness among the people regarding hair loss will lead to augment industry expansion. Platelet Rich Plasma (PRP) therapy market segment dominated the industry, accounting for USD 230.3 million 2017. Rapidly growing platelet rich plasma therapy practices in hair loss treatment will lead to more business growth opportunities in foreseeable future. According to recent International Society of Hair Restoration Surgery (ISHRS) report, worldwide about 58.8% patients were given PRP as healing therapy. Increasing adoption and efficiency of PRP therapy will promote faster healing with minimal scarring after transplantation procedure resulting in escalating demand for PRP therapy during the forecast period. Stem cell therapy market segment is estimated to grow at a CAGR of 25.8% during the projection years. The need for better hair transplantation and restoration procedures will help in driving the demand for stem cell therapy. Worldwide increasing prevalence of hair loss will stimulate the need for development of stem cell therapy as a potential treatment for hair loss problem. As per the International Society of Hair Restoration Surgery (ISHRS) report, more than 53% of the clinicians are in favour of development of stem cell therapy owing to various side effects of the currently approved drugs. Clinics hair transplant business generated maximum revenue share in the year 2017 with value of USD 3,482.8 million. Increase in number of speciality clinics that cater to the needs of rising number of alopecia patients owing to better outreach as well as economical and cost-effective hair restoration surgeries. With increasing demand for single session hair restoration surgeries and ability of clinics to provide varied and technologically advanced therapies, their demand is expected to further increase. 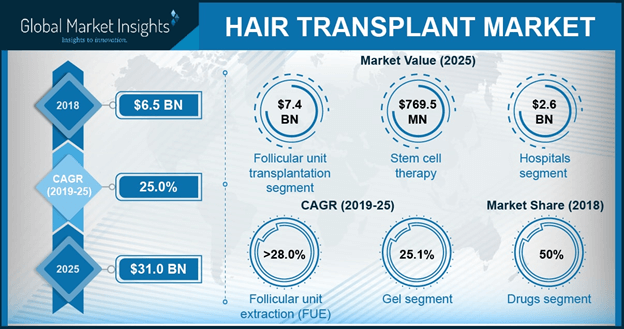 Hospitals hair transplant business is expected to experience robust growth in the hair transplant market at a CAGR of 25.1% over the projection period. Increase in number of multi-speciality hospitals that provide hair loss treatment will create more opportunities for the growth of hair transplant and restoration surgeries. The facilities provided by the hospitals for clear diagnosis of hair loss disorders will help provide guidance for further line of treatment. Rise in number of people opting for hair loss diagnostics and screening in hospitals will eventually boost the hair transplant market growth. U.S. dominated the North America hair transplant market with a total value of USD 1,744.4 million in the year 2017. Increase in number of hair transplant surgeries such as follicular unit transplantation (FUT) and follicular unit extraction (FUE) along with high success rate of treatment are major driving forces in of U.S. hair transplant market. The increasing cases of hair loss problems in U.S., such as male and female pattern baldness will foster the industry growth. According to American Academy of Dermatology, hereditary hair loss is the common cause of hair loss that affects around 80 million people in the United States. Factors such as dandruff, stressful life, smoking and consumption of fast food will lead to increase in hair loss problems, fueling the industry growth. India hair transplant market is estimated to show considerable growth in the coming years at a CAGR of 25.7% from year 2018-2024. Factors such as poor nutrition, smoking, stressful life and changing climatic conditions are responsible for increasing cases of hair loss problems in India. Stress is another factor that leads to hair loss. According to a recent survey conducted by department of mental health and behavioural sciences, 51% of the Indian population suffering from stress due to their work and other personal problems. Moreover, rising disposable income enables patients to avail relatively costly procedures. Some of the leading key players include Allergan Plc, Beiersdorf AG, Bosley, L'Oreal SA, Lumenis Inc, MEDICAMAT, PhotoMedex Inc., Restoration Robotics Inc., Solta Medical, Inc. These pharmaceutical companies have implemented strategic decisions to develop potential treatment areas. Merger and acquisitions, new product launches and increasing R&D activities has increased the company’s operational capabilities and sustain in the market by providing better solutions to the customers. Increase in people suffering from hair loss problems such as Androgenic alopecia, alopecia areata, scarring alopecias etc will drive the hair transplant industry growth. Also, recent technological advancements in the hair loss treatment procedures that help in minimizing the cost, procedure and recovery time, will increase the number of people opting for hair transplant treatment in the upcoming future. Rise in awareness among the people across the world regarding their physical appearance and hair loss will boost the market growth over the forecast period.